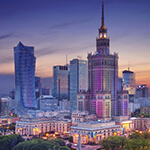 Warsaw is one of the youngest of Europe’s capital cities. This historic city was established on the banks of Vistula River at the end of the 13th century, but just 400 years ago became the capital, when the king of Poland, Zygmunt Waza III moved his seat from Cracow to Warsaw. This started the golden period of Warsaw, where the city developed rapidly. The best architects designed many churches, palaces and beautiful parks. Warsaw became the capital of Poland and the seat of Polish kings for the next hundred years. At the end of the 18th century however, the political situation was very difficult and Poland was divided among three countries: Russia, Prussia and Austria. Warsaw became just one of many cities under Russian rule. At this time, the Poles tried to regain their independence by fighting against its occupants. This also happened to be a fascinating period of developing Polish culture and science. During this period, the town was home for such people as the composer Frederic Chopin, Nobel Prize winning author Henryk Sienkiewicz, writer Joseph Conrad as well as Marie Curie who won the Nobel Prize twice. On the 11th of October 1918 residents of Warsaw could finally celebrate the independence of Poland. After 123 years of partitions the city became the capital of Poland again. World War II was responsible for a complete changing of the city. After the Warsaw Uprising in 1944, Hitler ordered his troops to wipe the city off the face of the map as punishment for this Uprising. The Germans proceeded to demolish and raze house after house. Almost 85% of the buildings were completely annihilated by the Nazis. After that, the city sometimes called Paris of the north was just a sea of ruins, but soon, like a phoenix rising from the ashes, was growing again. Most of the important monuments were rebuilt and the people who survived returned to their city. Today Warsaw is the biggest Polish city with a population of 1, 650,000 people and is the center of political, economic and cultural life of Poland. The streets are full of nice cafes and excellent restaurants, as well as many museums, theatres and cinemas. Unfortunately, by having a very energetic pace as well as growing very rapidly, the city can sometimes seem not to be a pleasant place. The years of communist rule have left many terrible examples of socialist architecture, but remember: It is impossible to understand the history of Poland without knowing Warsaw, so come and check it out!